Flying with kids is never easy, but flying with a baby is more nerve-wracking and a hundred times harder. The idea of your child not sleeping, non-stop crying and not to mention, those angry stares from fellow passengers will surely give you all the anxious feels. But don’t cancel that vacation just yet. With enough preparation (and plenty of courage) you can definitely have a safe, comfortable and pleasant flight with your little one. It’s highly important to let your agent know that you will be traveling with an infant. This way, you can strategically plan your seat, which also depends on the aircraft. Some airlines offer free charge for bulkhead seat and bassinet, and have different restrictions such as your baby’s weight. So it’s recommended to make reservations and arrangements ahead of time. Bring a car seat on board. For safety reasons, it’s best to put your baby on a car seat. It has been proven that children placed on the lap during flight are among those to most likely suffer injury or death in the event of an accident or severe turbulence. Although it’s tempting to save money (since a child under 2 often flies for free), purchasing a seat for your infant can ensure safety and more comfort for your baby, you and the passengers as well. Flying with little ones requires a bunch of paraphernalia and you have to make sure that they are all packed on your carry-on for easy access. And make sure to pack extra supplies because these days, delayed flights are quite common. 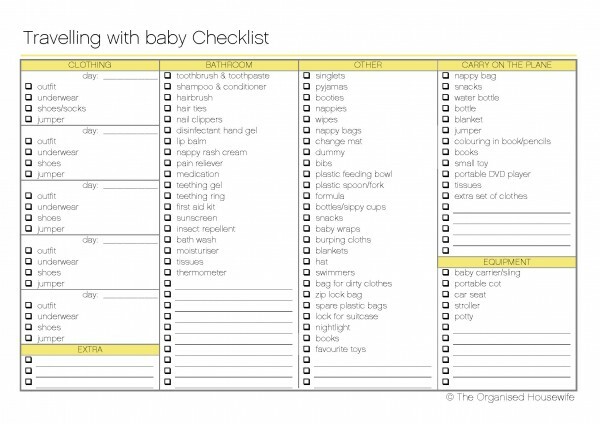 Here’s a free downloadable checklist I found online from TheOrganizedHousewife.com. Prepare for a comfortable takeoff and touchdown. The pressure during takeoff and touchdown causes major ear pain for babies. So before takeoff and landing, breastfeed your child or offer a pacifier or bottle because the sucking motion will relieve ear pressure and save your baby from discomfort, pain and tears. Lastly, be the bigger person and know how to apologize for your infant. I know, it’s not their fault but you also need to respect and empathize with your fellow passengers. This entry was posted in Children, Family, Parenting, Travel. Bookmark the permalink.